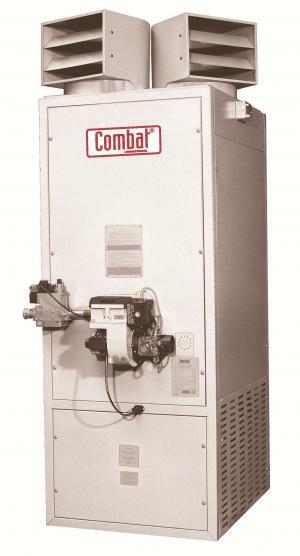 The Combat range of indirect air heaters includes Warm Air Furnaces, ranging from 24 up to 400 MJ output, and Cabinet Heaters, ranging from 160 up to 1000 MJ. Appliances are either fan assisted [Furnaces] or forced draft [Cabinet]. A tubular steel heat exchanger system is used in the Warm Air Furnaces achieving up to 90% thermal efficiency, and the units may be operated on Natural Gas or LPG. A range of styles is available ranging from suspended room discharge through to full ‘in-duct’ models. 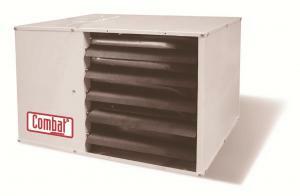 Cabinet heaters are available with Gas fired, Diesel fired or Waste Oil fired burners. Cabinet style may be vertical, horizontal or weatherproof and units have a standard drum and tube heat exchanger. For special custom applications, drum and tube heat exchangers are also available.